LEGO has the ability to add the Peter Pan syndrome. No matter what age you are, you’re never too old to enjoy it. This is something that applies to Mr Boo. I think that having children who also love LEGO has enabled him to revert back to his childhood. During the October half term, the NEC in Birmingham held BRICKLIVE. A four-day event dedicated to all things LEGO. Promising to be even better than last year, it boasted amazing new releases, the latest games, and lots of bricks! With Tigger enjoying his LEGO as much as Mr Boo, I wasn’t quite sure who was more excited to be attending. Arriving at the NEC we collected our wristbands and made our way into the BRICKLIVE hall. Tigger’s face was a picture as the boards opened up and the hall filled with all things LEGO was revealed. With so much to see and do, we opted to try to do it in a logical order. However, this was easy said than done as you were drawn over to other stands that caught your eye. The highlight of Roo’s day was the LEGO Friends dance zone. With sessions available throughout the day, fans were able to dance along with their favourite LEGO Friends characters. With the added bonus of being able to have their photo taken with them too. Deep down all of us have a favourite coloured LEGO brick (personally, I favour the purple bricks). BRICKLIVE understand this and offered different coloured zones where you could build whatever you wanted out of single coloured LEGO bricks. One of the main focuses of BRICKLIVE was LEGO Dimensions. The video game was launched back in September 2015, however, has just released it’s Wave 6 packs to accompany the game. With Wave 7 heading our way in mid-November. The retailer GAME was there to give visitors the opportunity to learn about LEGO Dimensions and try their hand at the game. With experts advising how the different starter, level, team and fun packs all incorporate into the gameplay. Characters from the LEGO Dimensions game had been made into statues within a special LEGO Dimensions area. With Tigger loving each of the characters, especially Gandalf. Alongside all that the show had to offer it had a very special challenge to complete for all those who were willing. It sounded quite simple, collect 20 different LEGO Dimension cards and exchange for a limited edition LEGO Dimensions Green Arrow figure. However, in order to get the cards you needed to earn them through various tasks. Playing on the GAME LEGO Dimensions demo, getting a LEGO Dimensions poster signed, attending the LEGO Dimensions demo on the BRICKLIVE stage as well as getting photos with LEGO Dimensions character around the event. Each one of these tasks would earn you a packet of 8 cards, which you may need to trade with other visitors or at the swap stations located in the Fan Zone. Thankfully after a little negotiation with the swap zone gentleman, I managed to get Tigger a full set so that we could get him one of the figures. He just has to hope that Santa brings him the LEGO Dimensions game for Christmas. There were a number of stands available along ‘Brick Lane’ to purchase a selection of LEGO products. A selection of both national retailers such as Toys R Us and STORE (A place for everything) alongside independents. One of the amazing things about LEGO is what you make with the bricks. 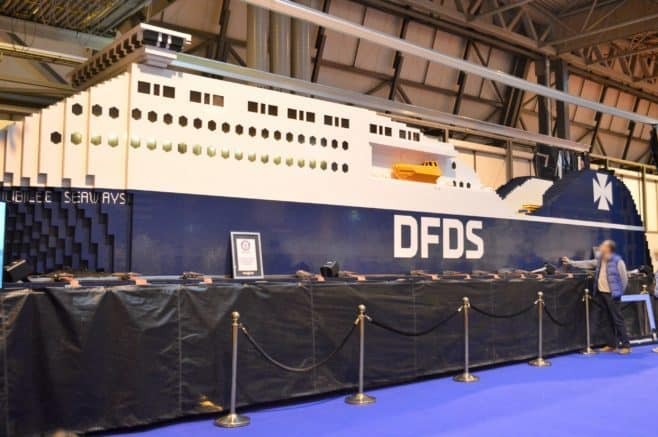 From the minifigures, right up to the DFDS record-breaking ship, which was built using over 1 million bricks. What a day we had! It would be possible to attend BRICKLIVE in just a morning or the afternoon rather than the whole day. However, with regular breaks for Piglet etc. it worked out well for us, plus I think the boys would have loved to have stayed even longer than we did. There were a wide range fo activities for the children to get involved in, live shows about different LEGO products and amazing displays for us to admire. With Brick Lane offering Mr. Boo and Tigger the opportunity to purchase sets that had been discontinued. With many of the retailers accepting cash, cards, and even PayPal payments. We will be keeping an eye out for next years BRICKLIVE dates. Disclosure: We received press passes FOC in order to attend the event.